This help file assumes that the Google Home device is already powered up and linked to your home WiFi network. The first step is simply to try and talk to the service My Spa Control by saying « Hey Google, talk to my spa control ». It will recognize the service and ask you to link it via the Google Home app. 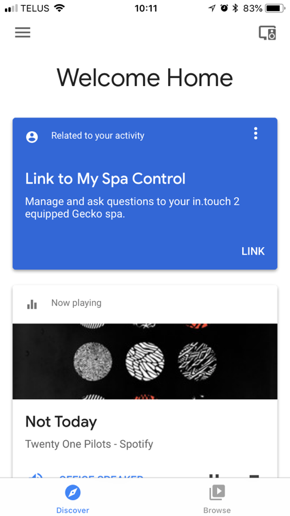 Tap on LINK, under the My Spa Control service, in the Google Home app to proceed. 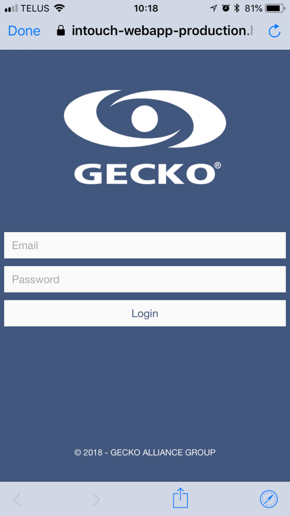 The app will then prompt the login page of the in.touch 2 app. 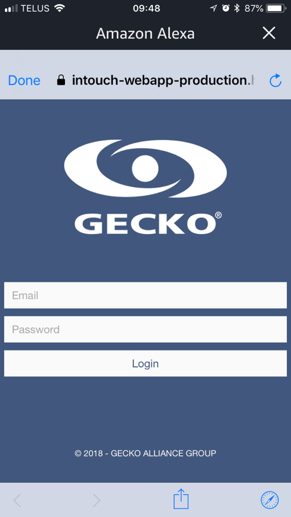 You need to enter the credentials of your in.touch 2 account in order to link the skill to your spa. Note that only one spa can be linked at a time. If you have more than one spa, you will need to alternate between spas by disabling the skill and re-enabling/linking it to one of the other spas. 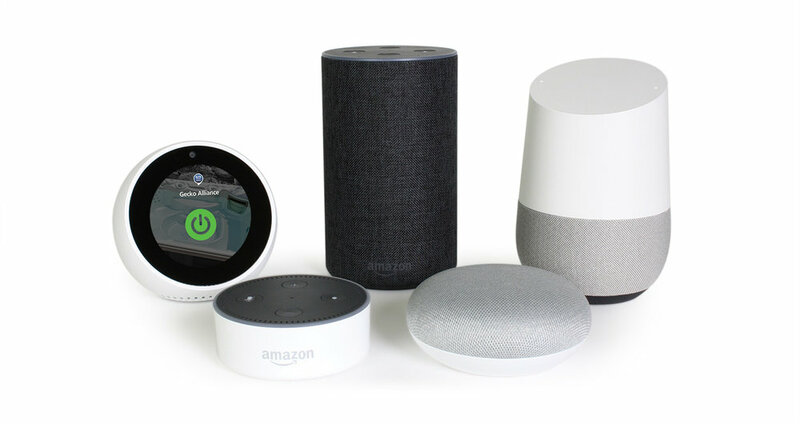 You will be prompted to select a spa if you have more than one associated to your account, otherwise Google Home will proceed to link the service to your spa immediately. Once this is done, you will be able to test the skill with your Google Home device and everything should work fine. If it doesn’t work, make sure all the steps above were followed and the correct account/service/spa were used/selected. If all was done according to the guidelines above, unlink the service and try linking it again. This help file assumes that the Alexa device is already powered up, linked to your home WiFi network and to your Amazon Alexa account. Note that Alexa skills are now only available to Amazon accounts set in English. The first step is to open the Amazon Alexa app and go to Skills & Games using the top left menu. Then type the skill name in the search bar (My Spa Control). 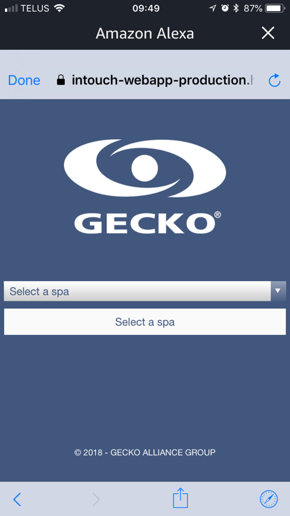 Gecko Alliance’s My Spa Control skill will be displayed. You just need to select it. Next step is to enable the skill by tapping on the Enable button. 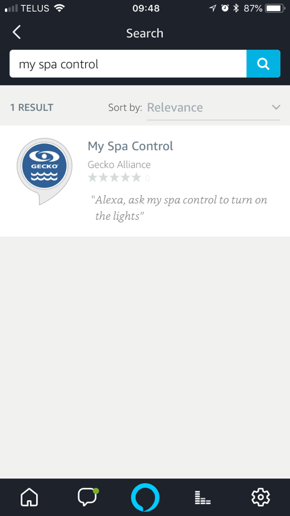 You will be prompted to select a spa if you have more than one spa associated to your account, otherwise Alexa will proceed to link the skill to your spa immediately. After you get to the successfully linked page, you will be able to test the skill with your Alexa device and everything should work fine. If it doesn’t work, make sure all the steps above were followed and the correct account/skill/spa were used/selected. If all was done according to the guidelines above, disable the skill and try linking it again. “Hey Google, ask my spa control…” followed by a supported command. 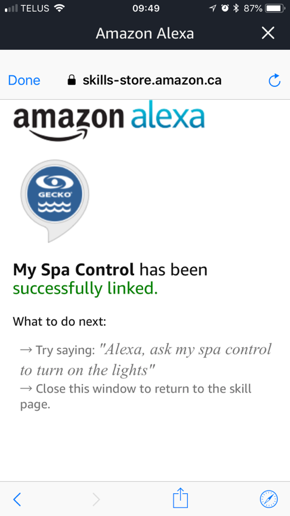 “OK Google, ask my spa control…” followed by a supported command. “Set the setpoint to x (Fahrenheit/Celsius)”, replacing x by the temperature you wish to set your spa to.